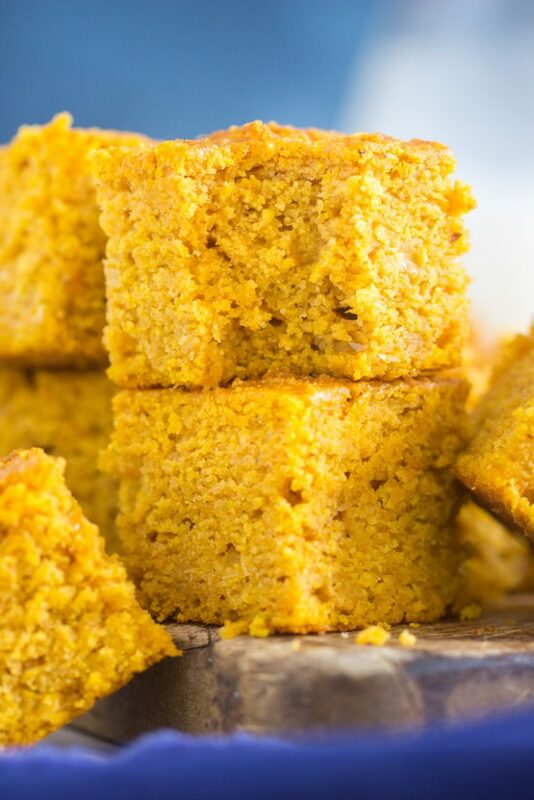 Insanely moist brown butter cornbread, kissed with honey, and full of pumpkin! This Honey Brown Butter Pumpkin Cornbread has got the best ingredients of life in it! 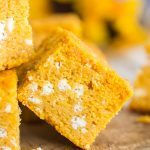 This Honey Brown Butter Pumpkin Cornbread is so simple, but so moist, flavorful, and with a hint of sweetness. You’ll never want to try another cornbread recipe again. I like to make a variation of cornbread every fall. As far as bready carbs go, cornbread is a top favorite. This Honey Brown Butter Pumpkin Cornbread recipe may top them all. I didn’t even realize how much I loved cornbread until my SIL made the best, moistest, most flavorful cornbread a few years ago for Thanksgiving. I was obsessed with how moist, soft, and sweet it was – the best basic cornbread I’ve ever tried. There is just nothing like a really, really good cornbread recipe. Enter Pumpkin Cornbread. I tweaked my SIL’s recipe and added pumpkin to it. Had to! This recipe is a few years old now, but it’s as awesome as ever, and I still make it every fall, at least once. 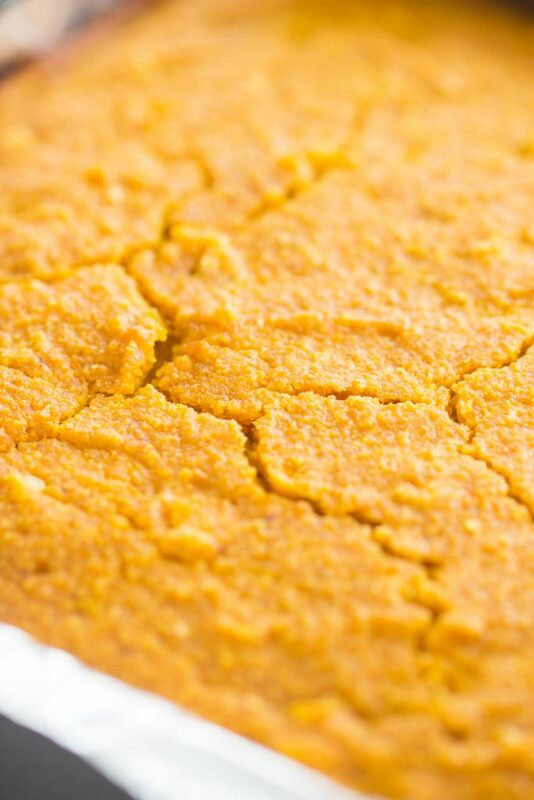 I then used my Pumpkin Cornbread recipe to create this Sweet Potato Cornbread last year. 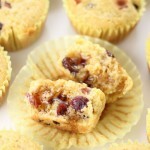 I’ve also used my SIL’s recipe to make these Maple Bacon Cranberry Cornbread Muffins and Caramelized Apple & Pecan Cornbread. I love to mix things up when it comes to cornbread, but my favorite versions are usually on the sweeter side – big surprise. This year, I’ve got two cornbread recipes to share, and the first is this Honey Brown Butter Pumpkin Cornbread. There is nothing I could love more about this Honey Brown Butter Pumpkin Cornbread. How many more incredible, fantastic ingredients can be crammed into a single cornbread recipe? It’s got honey and brown sugar for sweetness, along with creamed corn, and even the pumpkin provides a hint of sweetness. Pumpkin was made for cornbread. It adds subtle pumpkin flavor, but doesn’t overtake the bread. The best part yet: brown butter. I’m so looney tunes for brown butter. I even made brown butter frosting out of it. There isn’t anything that isn’t made better with the addition of brown butter. 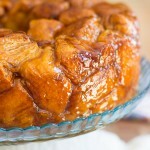 It kinda cuts the sweetness, and adds a rich, deep, nutty, sorta caramel-y flavor. Definitely the best part about this Honey Brown Butter Pumpkin Cornbread. I think it’s my new favorite cornbread recipe, and it will be hard to look back on other cornbreads now! 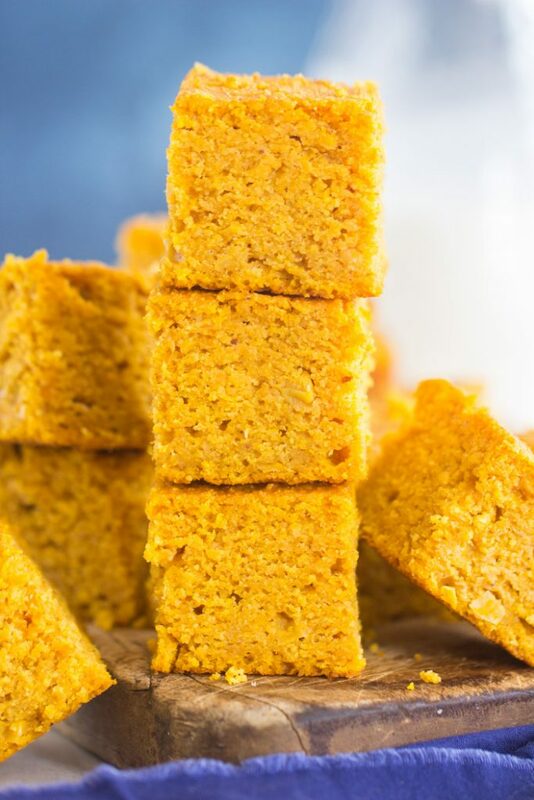 This Honey Brown Butter Pumpkin Cornbread is no more effort than most cornbread recipes – super simple, really – and if you want to impress guests for the holidays, this is the cornbread recipe you go to! 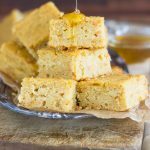 Insanely moist brown butter cornbread, kissed with honey, and full of pumpkin! 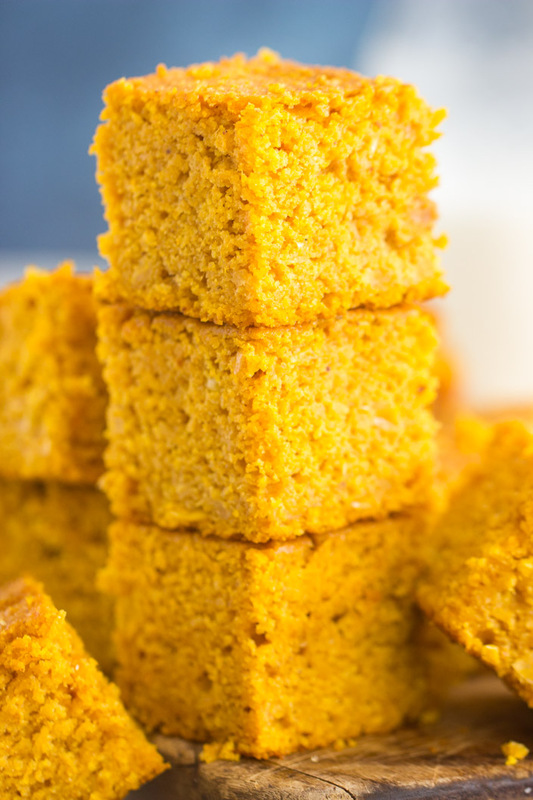 This Honey Brown Butter Pumpkin Cornbread has got the best ingredients of life in it! 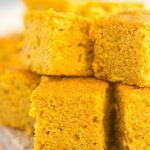 This Honey Brown Butter Pumpkin Cornbread is so simple, but so moist, flavorful, and with a hint of sweetness. You'll never want to try another cornbread recipe again. In a small saucepan over medium heat, melt the butter. 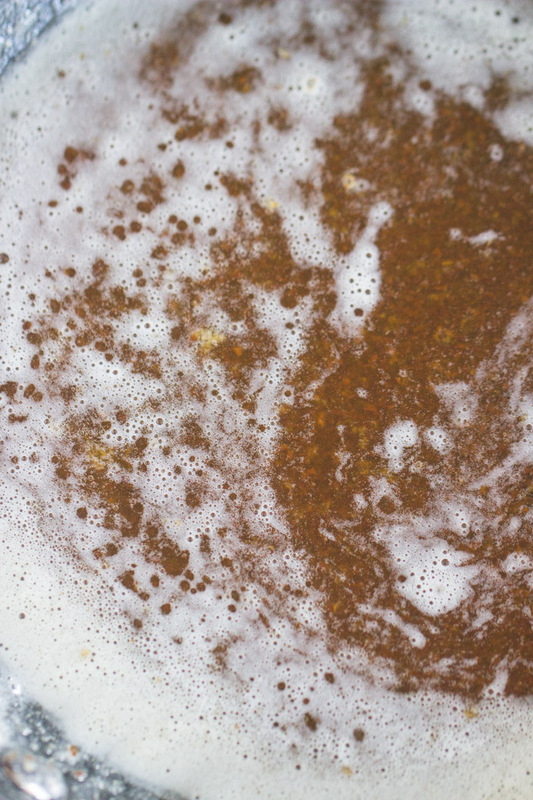 Continue cooking for 8-10 minutes, stirring occasionally, until it develops brown flecks and a nutty fragrance. Add creamed corn, pumpkin, and honey. Stir until just blended. Add egg, milk, and brown butter. Stir until just blended. Bake at 400 degrees for 35-40 minutes or until edges are golden, and a toothpick inserted near center comes out with a few moist crumbs.